- Additional comments: Applied update 04/03/2018. Also updated Universal Search to latest version (1.0.10-0163). 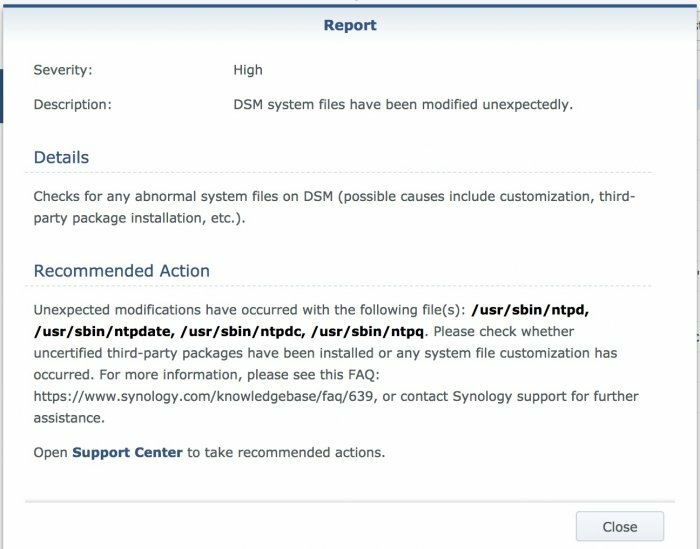 A scheduled weekly Security Advisor scan informed me of "DSM system files have been modified unexpectedly" (See attached screenshot). Don't know if it's a false positive or if it is related to the DSM update or Universal Search update. Other than these two updates the system has been untouched. - Additional comments: No Reboot required. However, I lost the OPENVPN profile under Control Panel > Network > Network Interface. Small potatoes.